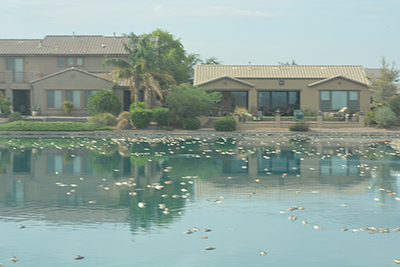 Home Tags Articles tagged with "The Lakes"
Mixed stratified water and blooming algae are the suspected culprits in a massive die-off of fish in The Lakes at Rancho El Dorado, a not uncommon result of monsoon runoff. 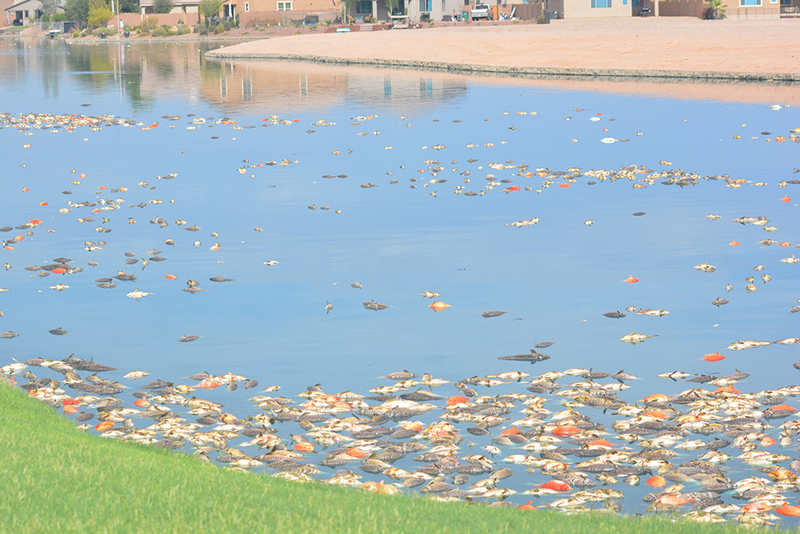 Some residents estimated 2,000 dead fish. Resident Tod Antell said residents were very upset with the sight and the smell. The situation was noticed last week during monsoon rains. Megan Perry, a Maricopa resident who worked for U.S. Fish & Wildlife Services, took a look at the situation and believes the monsoons played the biggest part in the die-off. “It’s natural and nothing to panic about,” she said. In summer, water levels stratify in lakes, she said, with warm, low-oxygen water on the bottom and cool, higher-oxygen water on top. The fish, other than being dead, look to be in normal health, with no indication of poisoning or other unnatural cause, Perry said. She noted the small minnows are still alive because they live closer to the oxygen and have less oxygen demand. Meanwhile, monsoons can also cause algae bloom, which can be fatal to fish as well when soil is washed into the water. The soil creates an overload of nitrates. Algae bloom, eat the nitrates and then die. Bacteria devour decaying algae and, in the process, use up much of the oxygen in the lake. In the Lakes, it was apparent some fish were dying last week. By Monday morning, the result was thousands of dead fish, affecting every reach of the lake. Mayfield, the resident, said she had contacted the homeowners association, Associated Asset Management, which is responsible for the lake conditions. “I contacted the HOA emergency line last night,” she said. “They said that they would be dealing with it today. I have contacted Fish and Game Department. They advised that the HOA needs to deal with it. I have contacted the company that handles the water for the lakes and they stated that they are taking care of it. I have contacted the health department and also, again, the HOA today. I left a message again; no call backs. As of right now, we have not seen anybody coming out to address any of the issues so far this morning. Perry, the local fish expert, said water features can help mitigate the situation. The Lakes does use landscaped water falls and other aerators in some locations to churn the water, when they are functioning. Staff reporter Michelle Chance contributed to this story.